THE leading lady in the fight against female genital mutilation in Tanzania captivated local members of Soroptimist and Amnesty International recently. Rhobi Samwelly spoke to a packed house when she visited Woking to present her project to protect girls in the northern region of the country. Circumsising boys and girls to prepare them for adulthood is traditional in many African countries. For girls especially, parents consider marriage more important than education to ensure their well-being as adults. They fear a girl will not marry if she is not circumcised. But the procedure can have long-term adverse effects, especially if it is done badly – hence the term now used ‘female genital mutilation’. Tanzania has outlawed the practice but the message is hard to enforce in remote areas without proper roads, such as the Mara region in the north. Rhobi said: “My Diocese in northern Tanzania is committed to protect children, girls and women of whatever faith from physical, sexual, psychological and economic violence. The project uses actors and dancers to convince the people in rural villages. Inevitably some families agree to abandon the tradition more readily than others and girls can be rejected if they refuse circumcision. So a safe house and training centre is needed to protect the girls, while seeking to reconcile them with their families, and to give them skills so they can live independent lives. The building is well advanced but funds are needed to fit out and run the safe house. 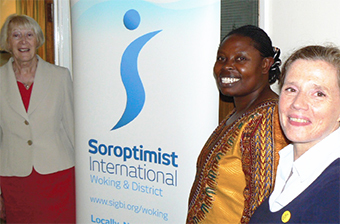 The Woking branches of Soroptimist (SIWD) and Amnesty International jointly organised the event, and explained that they were pleased with the healthy attendance. Barbara Hipkins Wilson, President of SIWD and Ruth Breddal, who leads the Amnesty branch, explained: “Rhobi’s project is inspiring and shows what can be done to help girls resist FGM.